Of course I’m about three weeks behind on my entries here at troutfactory, but that’s what happens when a new semester begins. In any case, this entry will be the first in a string of entries related to ohanami (blossom-viewing) season. During the beginning of ohanami in Osaka, I took the train up to Minoh to meet Yumiko for blossom viewing in Minoh Park, at the top of one of the nearby peaks. We walked up toward Minoh Falls, but turned off to the left where the enormous Minoh hotel and spa resort looms out of the mountainwork. We grabbed the elevator, which reminds me of something by Corbusier, and then took a shuttle to the top of the mountain where the sakura grove is located. Unfortunately the cold mountain air had kept the sakura from blossoming, and so only a few of the trees were starting to bloom. Still, it was quite nice to have lunch and look out at the view of Osaka. 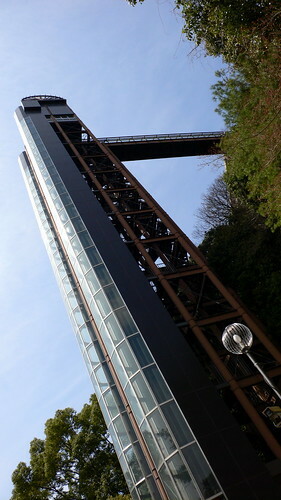 Here’s a view of the elevator that takes you up to the Minoh hotel and resort. 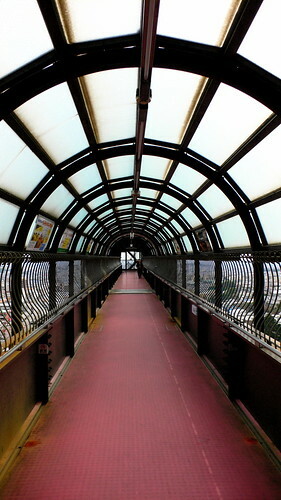 And here’s a view of the connecting passage between the elevator tower and the hotel. I like this view because it reminds me of the fantasy architecture in Flash Gordon. 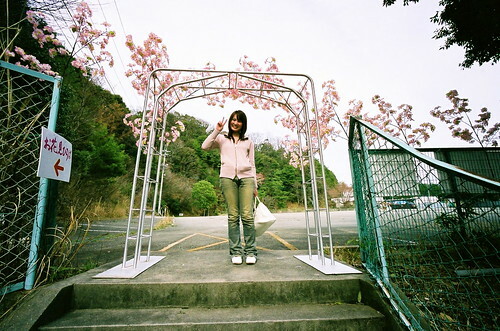 Here’s a picture of Yumiko on the stairs leading to the sakura grove. Unfortunately, the only flowers that were in full bloom happened to be the plastic ones decorating the entrance gate. 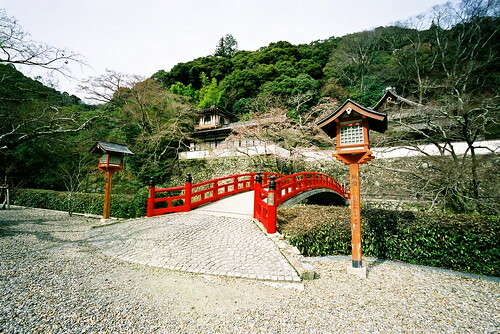 After we had lunch we walked back down to the trail that leads up to Minoh Falls and we followed it along the river until we came to Ryuanji Temple, a temple dedicated to Benzaiten, the goddess of music, learning, poetry, and art. That is to say, my kind of goddess. The goshuin stamp from this temple is a beautiful representation of the lute that often accompanies depictions of Benzaiten. 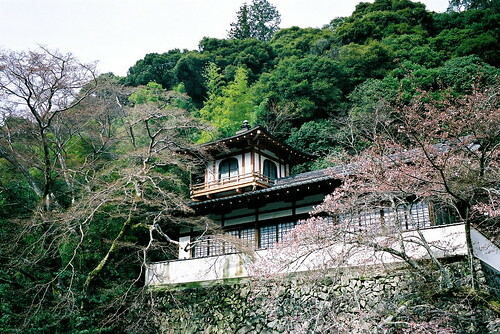 This is a view of the monks’ quarters, located on the opposite riverbank from the main hall at Ryuanji. 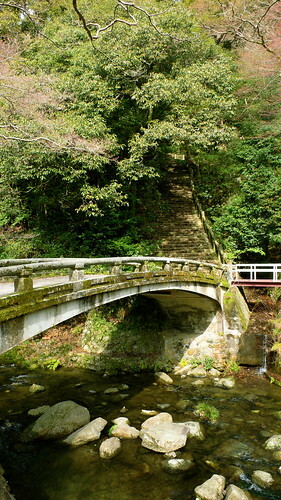 The arched red bridge that crosses the path and the river is locally famous. Here’s a closer view of the monks’ quarters, framed by cherry trees that are just beginning to blossom. These stairs promised to lead to a view, and so we followed them. Uphill. For about a kilometer, I think. It was hard going, but fun — alternating between stone steps and wooden steps we kept walking up through the clean air of the forest until finally we came out in a clearing with a gazebo for viewing. The view of Osaka was really nice, but the hazy photo of the view isn’t really worth looking at. After we walked back down the mountain we decided to stop by the Minoh Insect Museum, which is a really fun place (though primarily intended for kids). In addition to the cases and cases of interesting insects on pins, the cages with live insects on display, and the ‘interactive’ exhibits, there is a butterfly hall. The butterfly hall is just like an arboretum, but with butterflies too, flying all around and practically landing on you. There are two stories and you can walk around, listen to the bubbling of the water, and watch butterflies drink nectar out of blooming flowers. It’s pretty great. But don’t go in if you get freaked out by butterflies. 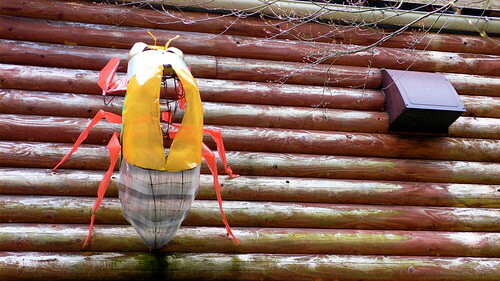 Here’s the giant plastic cicada that greets you as you approach the insect museum. 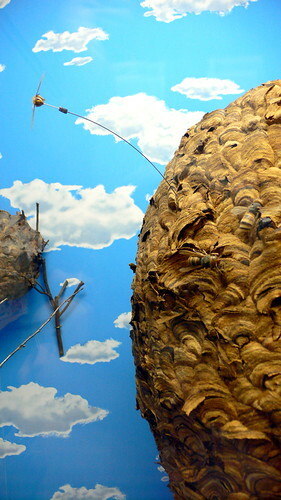 A photo of a cool display featuring paper wasp life. Or perhaps ‘still life’ would be a better way to put that. 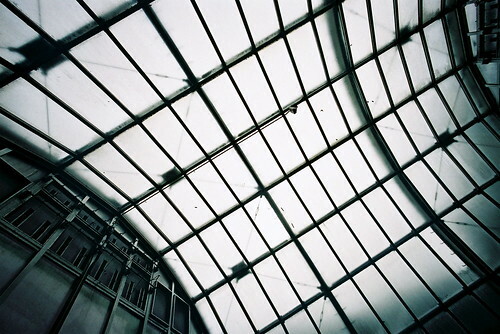 The ceiling of the butterfly hall at the Minoh insect museum. This was the coolest of all. 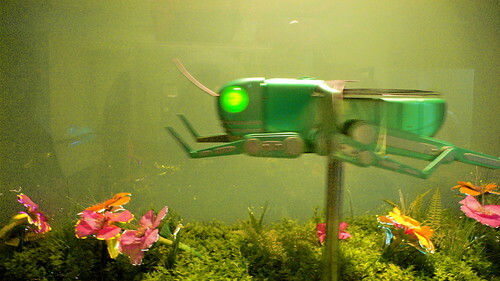 There is a grasshopper-bot that ‘jumps’ once every ten minutes so you can see how a grasshopper flies in robotic strange-motion. The grasshopper flies over a field of brightly-colored, psychedelic flowers and there’s a theme song that plays when it flies. You get to hear the theme song in the distance once every ten minutes during your entire stay at the insect museum. 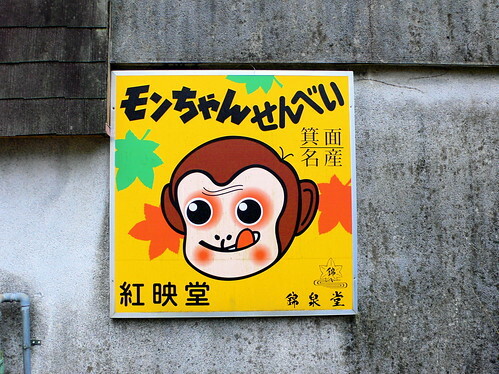 Of course, Minoh is famous for its monkeys (which you’re not supposed to feed! ), as well as its monkey crackers, which are being advertised for by this sign. After returning from the insect museum, Yumiko led me to a beautiful, sakura-lined street with the trees in full bloom. 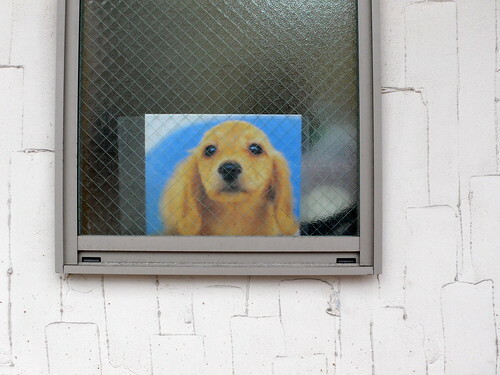 On the way there, however, we passed this perfect trompe-l’oeil doggy in the window. The photo-doggy’s head was precisely the size on an actual dog, at precisely the height in the window the dog would be at if it were actually standing there. 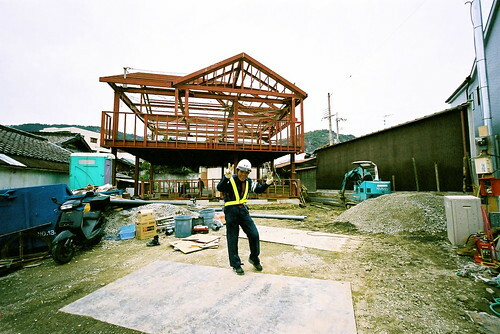 On the way back from sakura viewing, Yumiko and I passed a construction site, where I decided to take a picture of the floating red house frame that seemed to be hovering in the air (a bit like a Platonic form). When the safety guard at the entrance noticed that I was taking a picture, he flashed two vees and an amazing toothless smile. This has got to be one of my favorite photographs of all time. Best viewed large. After the blossoms, there was some drinking at a nice bar and restaurant in Minoh. 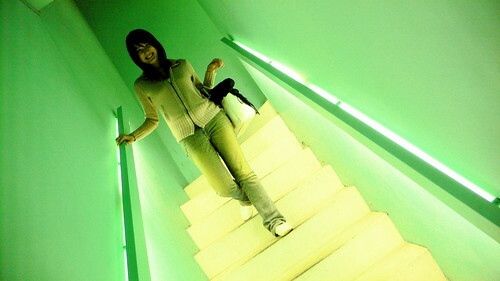 In this photo, Yumiko ascends into the alien greenness of the bar. The bar iteself is defined by an interesting kind of random cubic topographic texturing. I’ve been to Minoh Park to view the autumn colors several times, and it really is gorgeous. This post has a few autumn images, though I think they were taken a bit late and the colors weren’t as spectacular as they would have been a week or so earlier.